Superman manages to eventually save Lois, Jimmy, Metropolis, and the Earth, from Luthor's schemes involving coin tokens that transport hoodlums, synthetic Kryptonite, ray guns, rockets, and a Directional Cyclotron! Five more chapters of this serial. Still enjoying it very much. This puts me 2/3rds of the way through the serial. One thing did leave me rolling my eyes a bit on one of the chapters this time around. Something that to me went a little far.They have Superman come crashing through a barn door to save Lois and Jimmy. Instead of tearing the whole door down... or completely smashing the door to bits... what do they do? The create a hole in the door in the shape of Superman. That just felt way too cartoon-ish in my opinion. Note to Jimmy: This is a recycled review... I already have this review for Superman: Doomsday on the site. No need to add it to the list again. This is the last five chapters to the second Superman serial. Over-all a good serial that I enjoyed quite a bit. I would say I probably enjoyed this one even more then the first one. I am glad I picked up this collection of movie serials. It is the second time I watched each of them and enjoyed them just as much as the first time. This set comes with a couple of fun extras included... a featurette on the making of the serials and excerpts from the feature length documentary Look, Up in the Sky! The Amazing Story of Superman. Ok... I think I am about burned out on superheroes now after this one and the Batman marathon I had earlier... so I think it is time for me to go on to something else. So this ends my Superman Marathon. Pete had never reviewed this one and I've decided to do it myself. Evidently it doesn't really fit in neither of my 2 reviews topics so I've decided to place it here. For me a super hero doesn't need to be completly serious and depressing (that's why I've no intention to watch the recent Batman). OK I want to have a little seriousness, but I want to have some enjoyment out of it. This one was not really a big hit since it cames just after the awfull piece of crap that was (and will always be) Superman 3. This kind of sad since this was the best thing in this franchise after the original (sorry but Superman 2 is bad, at least the theatrical version). I agree the vilain is cartoonish, but common it's Faye Dunaway so who cares (at 43 she was always great to look at). Talking of great to look at, Helen Slater what a great discovery from this movie. She can act and she sure look good (the outfit looks certainly better on her than on Christopher Reeves), too bad that she doesn't had a better career because this movie was a box office failure. Even Maureen Teefy an actress that I like was in this and for one time she doesn't sing (her singing voice is awfull). Peter O'Toole is good too in his little role. For the rest of the cast nothing really impressive and a lot of waste talent. Maybe it's a little silly film, but it doesn't make a joke of the Superman franchise like all the others after the original. I don't count Superman Return that wasn't a joke but a whining boringfest. It has been a while since I watched this one.... I really should watch it again at some time soon. Just won't be this weekend... as I have a marathon planned that this just wouldn't fit in. I'll probably get this one eventually to add to my superhero movie collection if nothing else. I wasn't impressed when I saw it before, but I'll probably still get it. It contains both the International Version and the Director's Cut as well as some decent extras. For those of you with a R2 player and still waiting to buy the Superman movies, amazon.co.uk has currently the Superman - Ultimate Collection for 26 pounds. It contains 13 discs. 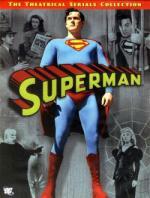 This includes all four Reeve movies (including the Donner cut of Superman II) and Superman Returns. That is what I have...The Ultimate Collection.